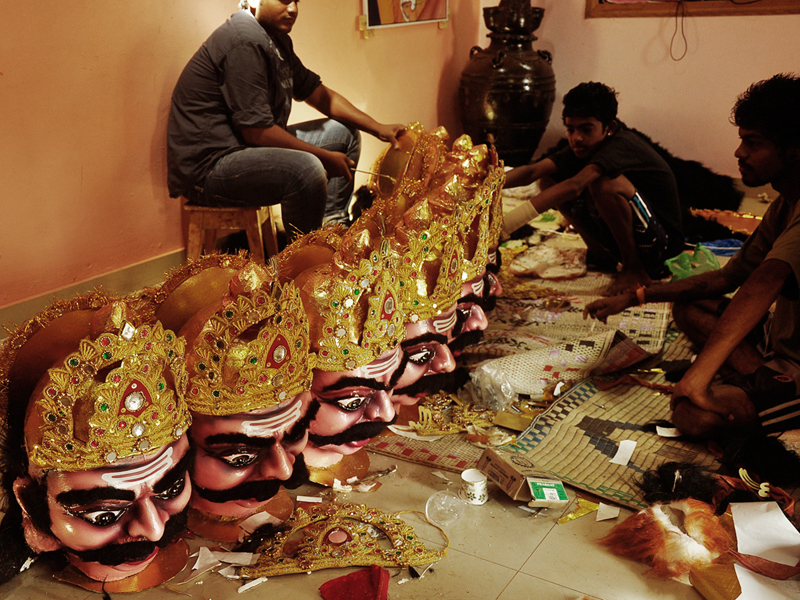 Artists creating a puppet of ten headed Ravana. 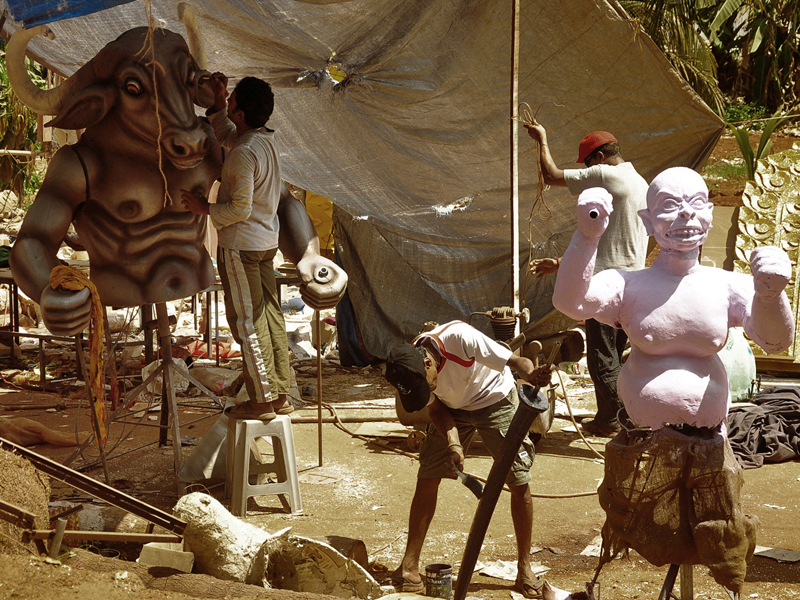 The artists engaged in detailing the puppet for the parade of Shigmo. 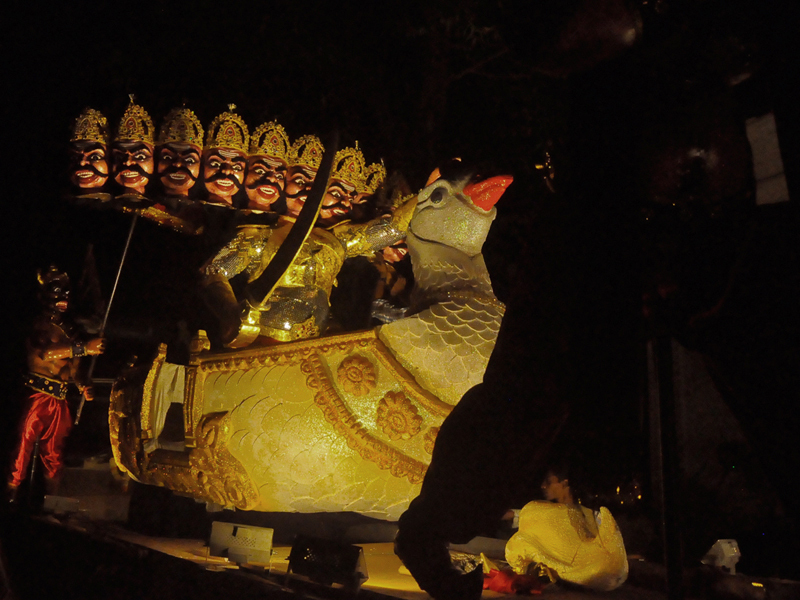 Float carrying the mobile puppets of unusual gesture of Nandi in the battlefield with behemoths. This is one of the participants wearing makeup of Sai Baba in the parade. 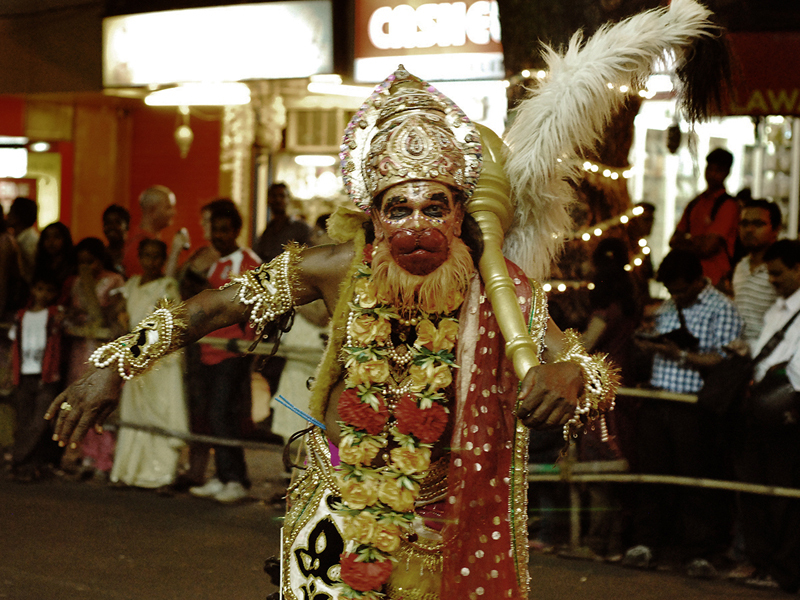 This is one of the participants dressed up like the Lord Hanuman from the Indian mythology in Shigmotsav procession. Every season in India is welcomed by a special festival in order to express gratitude and to foster the feelings, of love for nature. 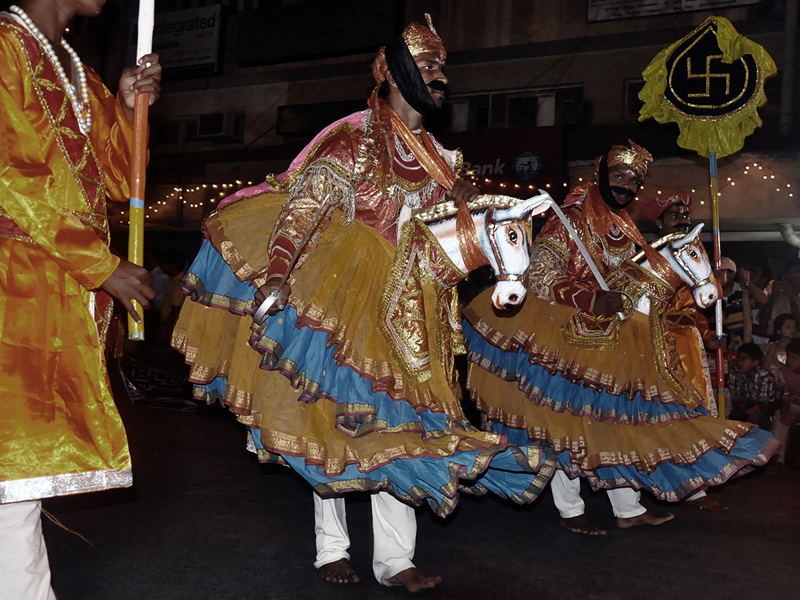 ‘Shigmotsav’ is one of them which is popularly known as Shigmo. 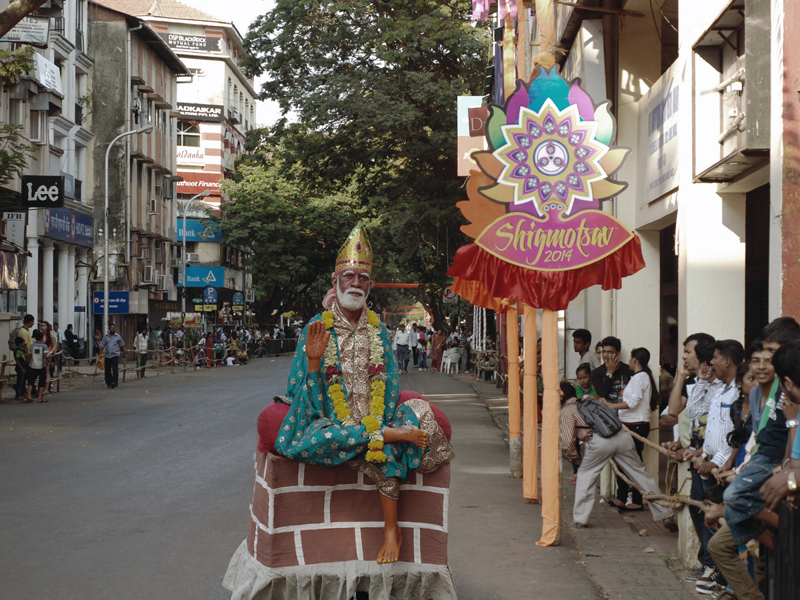 In Goa, Shigmotsav is celebrated by common people. 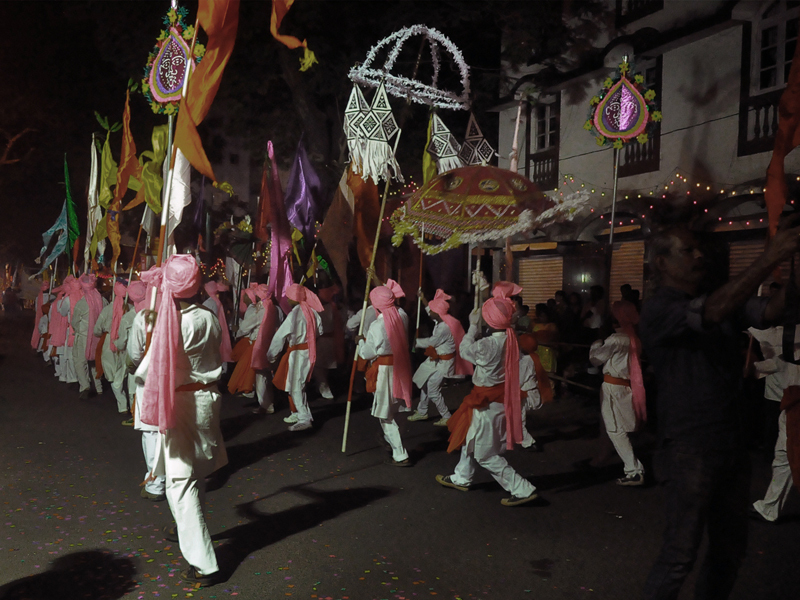 Bidding adieu to the winters, Shigmotsav is celebrated on a full moon day during the month of March (Falgun), which is also the last month of the Hindu calendar. 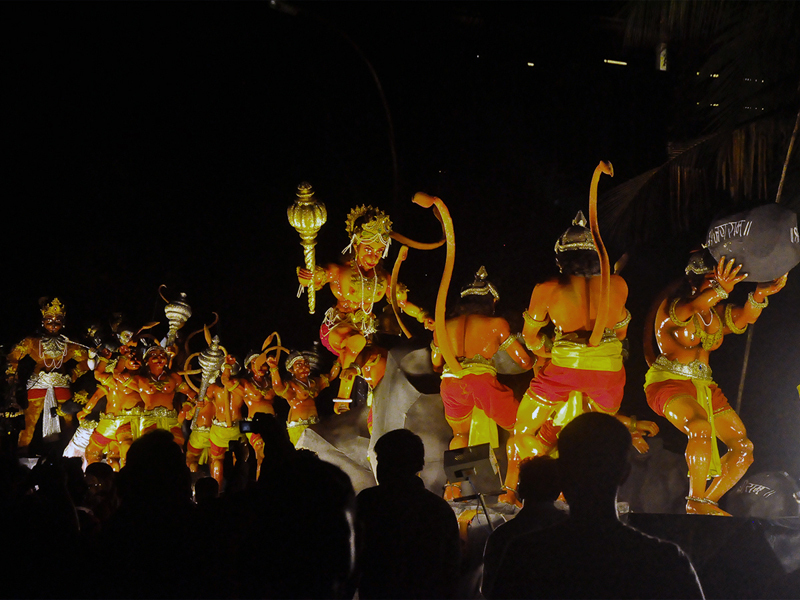 It is usually celebrated fourteen days before the festival of colours, Holi. 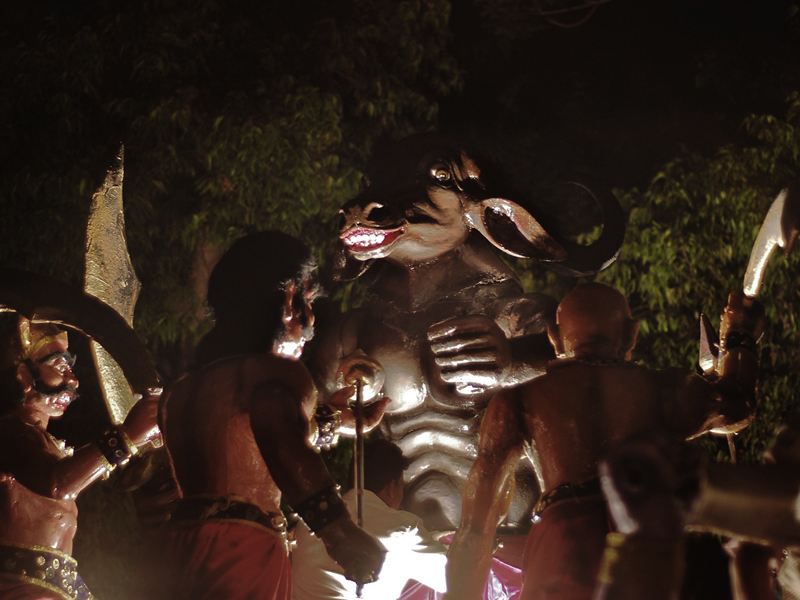 The Hindu Goan ethnicity begins the celebration with a collective prayer and naman, where they kneel together making a vow, shunning intoxicants and non-vegetarian food – from the ninth moon day up to the full moon day. 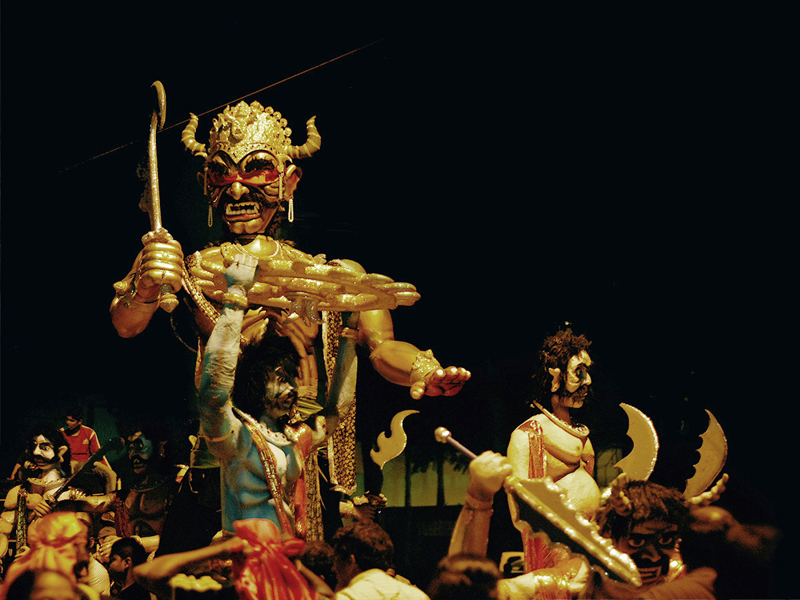 On the eleventh Moon day until the fifteenth moon day villagers assemble in their multi-coloured attires setting the mood for festivity with column-like red spotted flags – ‘Dhwaja’, beating the drums and playing flutes together at the village temples, and performing dances within the temple courtyards while singing various folk songs. 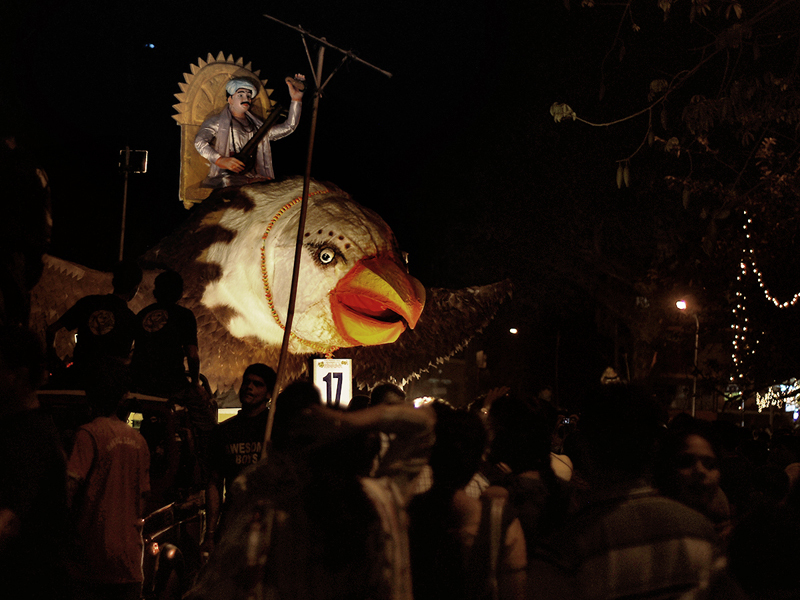 The celebration starts in the afternoon and goes on until the moon shines high in the sky. 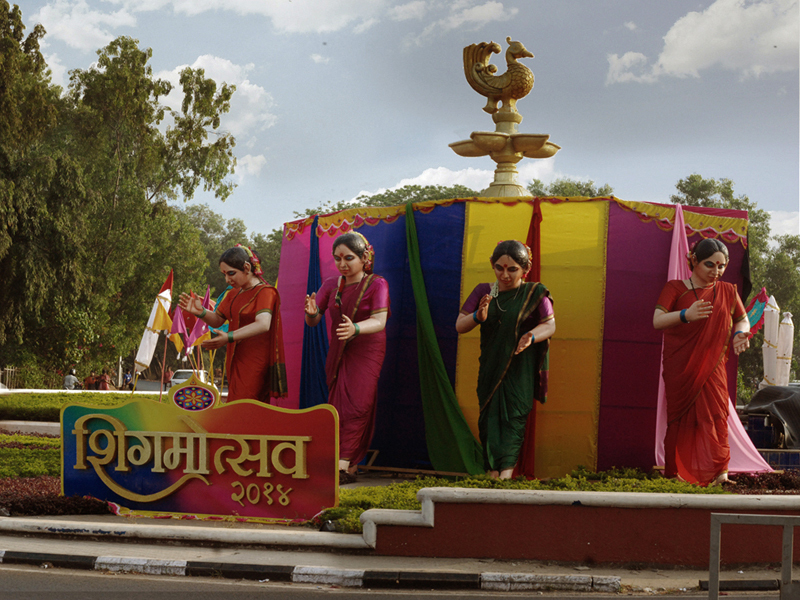 In Goa, Shigmotsav is celebrated across 5 days, with the gaiety of one-day carnivals that takes place on the main road of Goa, Panjim, Mapusa, Vasco & Margao on each day; they become an eye pleasing treat for tourists travelling during these months.